Join us for our Spring Dansko Trunk Show! Browse spring styles, meet with the rep, receive a gift with purchase, and enter our raffle! Make sure to visit us in store to claim special offers and discounts! All sale buy 1 get 1 half off! Our sale racks are jammed full! Buy one sale shoe and receive a second pair of equal or lesser value at half off the original price! No coupon needed. Our Bi-Annual SAS Sale starts on March 4th! 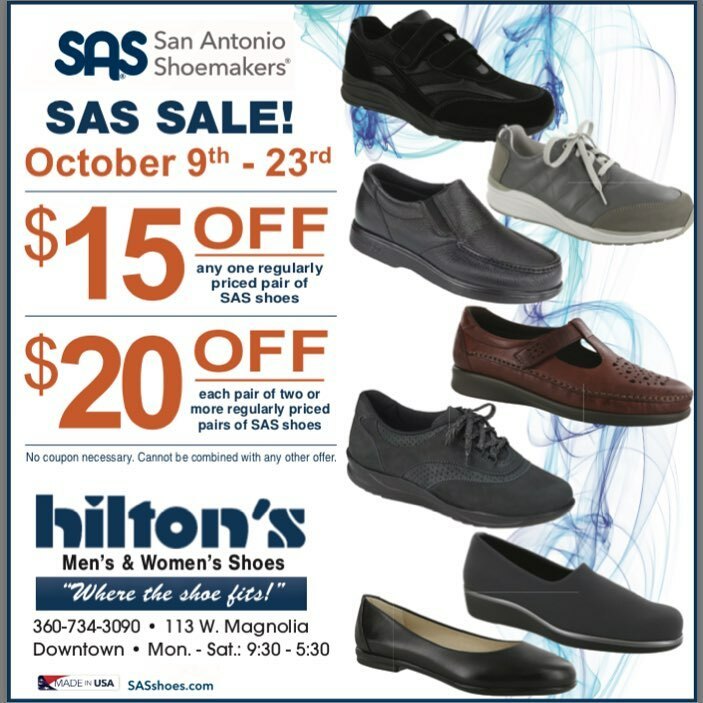 Receive $15 off one pair of full price SAS shoes or $20 off each pair of 2 or more pairs! Offer valid on special orders and in stock items. Not valid on sale shoes. Cannot be combined with any other offer. No coupon required. Introducing Hoka One One! Join us for our trunk show as we introduce Hoka to our store for the first time. Meet the rep from 11- 3pm, browse new styles, and enter our raffle for a $75 Hilton's Shoes gift certificate. Our Bi-Annual SAS sale is set! Enjoy $15 off one pair OR $20 off each pair of two or more. Sale valid on special orders and in stock items. Join us for our fall Dansko Trunk Show! Browse new fall styles, meet the rep, receive a gift with purchase, and enter our raffle for a chance to win a free pair of Dansko! Join us May 25- 26th for our Birkenstock Event! Browse our new spring styles and enjoy a gift with purchase! Join us on May 5th for our Dansko Trunk Show! Browse new spring styles and meet the Dansko rep. Try on a pair of Dansko shoes to be entered in our raffle for a free pair! Our Arcopedico Event will be happening March 17th! Come in and try on a pair of Arcopedico to be eligible to enter our raffle to win a free pair! Receive a gift with purchase and more! Get ready for our SAS sale happening in March! Receive $15 off one pair OR $40 off two pairs or more! Browse our new spring styles or stick with your favorite classic. Valid on full price SAS only. Valid on special orders. Cannot be combined with any other offer. No coupon needed. Join us for our Arcopedico Trunk Show. Meet with the reps, browse fall styles, and get a gift with purchase! We hope to see you all there!! The SAS Lifestyle Express is coming to Bellingham! Style and comfort is on the move! Come out and see us as the Lifestyle Express sets up shop at our store. Lifestyle Express is similar to a trunk show, but revolutionized into so much more. It brings a large selection of the newest SAS styles and colors in a wide variety of sizes for a 48-hour in-store party. Lifestyle Express offers a high-energy and totally unique buying experience. We load up our mobile stockroom with a selection of SAS's newest styles and colors. Join us and discover what's new with SAS! Keep an eye out in The Bellingham Herald and Facebook for our Memorial Day Weekend coupon! We will be closed for Memorial Day on Monday the 29th. We apologize for any inconvenience this may cause. Join us this Friday and Saturday for our first ever Birkenstock Event! Buy any Birkenstock and receive a FREE gift with purchase. Put your name in the raffle for a chance to win a Birkenstock sandal, a $100 Hilton's Shoes gift card, a $50 Hilton's Shoes gift card, or a pair of Smartwool socks of your choice! Has your mom been wanting a new pair of Summer Birkenstocks? Mother's Day is this Sunday. Come in and buy her the shoes she has been wanting. If you needed another excuse to spend an afternoon downtown here's one! For the month of December, parking on the top and bottom floors of the Commercial St. parking Garage is free! For the month of December, our Holiday Hours will be Monday- Saturday from 9:30- 5:30 and Sunday from 12-4! We will be open on Saturday, the 24th, from 9:30- 4 and closed Sunday the 25 for Christmas Day. Saturday the 31st we will be open from 9:3-0 4 and closed Sunday January 1st for New Years Day. Keep an eye out in The Bellingham Herald for our coupon! Created by American Express in 2010, Small Business Saturday® is the cornerstone of American ExpressShop Small efforts. While Small Business Saturday is highlighted as a special day when we can show our support as a nation for small business owners and our communities, the Shop Small Movement is a year-round campaign to celebrate and support small businesses every day. When is Shop Small Saturday? Small Business Saturday is celebrated on the Saturday after Thanksgiving. This year’sSmall Business Saturday is November 26, 2016. As a consumer, you can support small business in lots of ways. You can go shopping or dining at a local small business, invite friends to shop with you, or share on your social networks where you #ShopSmall. Find new small businesses in your community through the Shop Small Map at ShopSmallNow.com. What resources are available to me as a small business owner? Our Black Friday sale starts today! Keep an eye out in The Bellingham Herald for a coupon! We will be closed Thanksgiving Day, and will reopen Friday the 25th for Black Friday!